An occasional feature in which we spotlight the ridiculous trend of recontextualized basketball jerseys. Today: The Diesel, Shaquille O'Neal. Scene: That Harvard party we visited previously. Analysis: Well, you can see pretty clearly what's happening here. They both seem to be enjoying themselves, that's what's important. But before you ask: Yes. Ladies is hoopsters too. 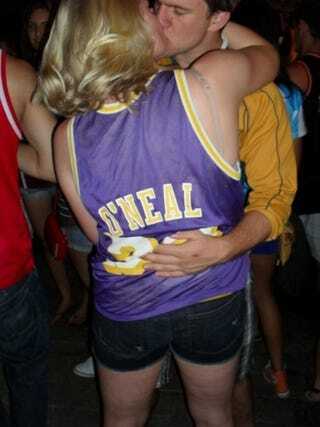 Pluses in her favor: those Laker jerseys were much cooler than the ones they have now. Verdict: Poorly executed Jay-Z allusions aside, this seems like a hoopster to my completely subjective eyes.